HB Body 2K Fibre Glass Polyester Filler. This Fibre Glass filler is a Two-component polyester cement screed with a rust inhibitor and containing fillers in the form of short glass fiber. This HB Body stopper is flexible and solid, even after applying thick layers. It is also used for repairs of laminates (boats, swimming pools, etc.). 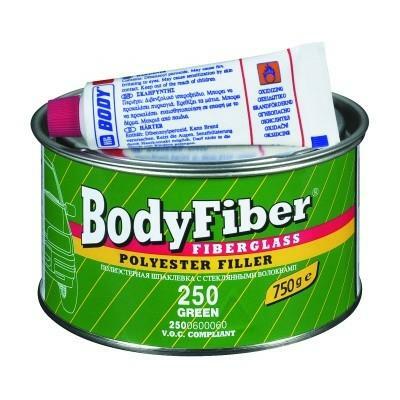 Fiberglass 2K polyester filler for bridging and filling of cavities. Also suitable for filling over corroded surfaces.Easy to apply, dries quickly and is easy to sand with P80-120 grit paper. Resulting in a high resistant and elastic surface. Please note; this product is 1.5kg and not 750g as it shows on the picture.